Sizzler! 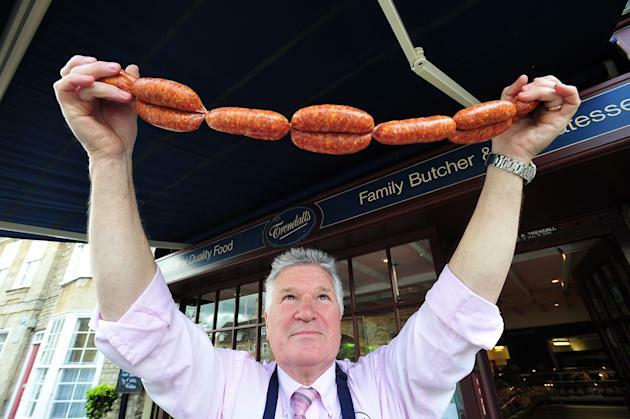 Butcher creates 'hottest sausage in the world' with chillis used in grenades! A butcher claims to have created the world's hottest sausage - using ingredients normally used to flush-out terrorists and scare elephants. The fiery bangers are filled with up to four Indian Bhut Jolokia chillis, paprika and chilli powder. The 'pork inferno sausages' are so hot customers are warned to only eat one per sitting in case they end up in hospital. 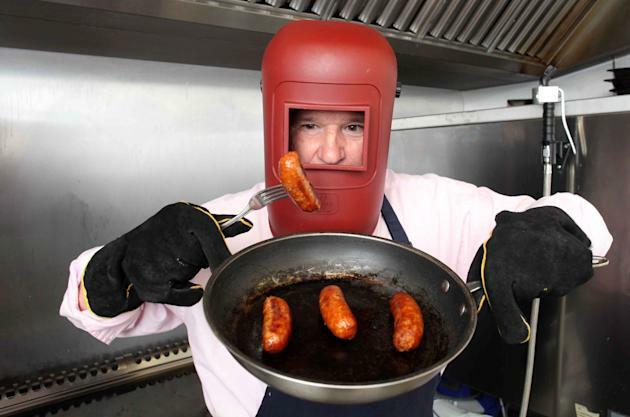 Butcher Martin Trendall, who came up with the recipe, says he wears goggles, a chemical warfare suit and a mask when he mixes the ingredients. Martin, who runs Trendall's Butchers in Oundle, Northants, believes the combined Scoville scale - used to measure the heat of peppers - of his ingredients makes it a world beater. He said: 'We are confident that we have created the world's hottest sausage. 'A few of our customers asked us if we could come up with a spicy sausage so that's exactly what we've done. 'We are keeping the exact recipe a secret but we've worked out the overall Scoville scale is well over one million. 'I would challenge anyone to come up with a hotter sausage. Martin, who has run the butchers for 41 years, has even slapped a hazard warning on the sausages. He added: 'We have had to warn customers to eat the sausages one at a time because they do contain some seriously hot ingredients. Martin and his team of eight butchers came up with the mixture after watching an American cooking TV show. Bhut Jolokia chillis are so hot they are used in hand grenades by the Indian Army to flush out terrorists. Scientists at India's Defence Research and Development Organisation (DRDO) announced plans in 2009 to use the thumb-sized chillis as an anti-terror weapon. Tests by Warwick University rate the Bhut Jolokia chilli - known as 'ghost chillis' - as 1,041,427 on the Scoville scale which is used to measure the heat of peppers. Ghost chillies are 401.5 times hotter than Tabasco sauce. In north-eastern India, people use them to scare off wild elephants by smearing them on fences. And in 2009, scientists at India's Defence Research and Development Organisation announced plans to use the chilli peppers in hand grenades, as a way of flushing out terrorists. The sausages went on sale this week costing £11.25 per kilo (around eight sausages). Butcher Stuart McDonnell, 34, said: 'They are so potent we have to wear goggles and masks to mix the ingredients together in case it gets onto our skin. 'I've tried the sausage and could only manage a couple of bites. Customer Ashley Beland, 26, was visiting the area from her home in Swadlincote, Derbyshire, and was one of the first to try the sausages on Friday. She said: 'My eyes were streaming - I didn't expect it to be so hot. 'That little sausage has quite a big punch. It's definitely the hottest thing I've ever tasted in my life and I'm usually good with spicy food. 'It has this slow burn that builds up as you chew and within a few seconds I needed a glass of water. 'I couldn't feel my face - it was just numb with the heat. I've never had anything like it in my mouth before. 'My taste buds were on overdrive and it took half an hour for the burning sensation to stop.